Since his selection by the Washington Wizards with the third overall pick in the 2012 NBA Draft, Bradley Beal, along with other players like John Wall and Otto Porter, have been able to make the side become a perennial playoff team. This is thanks to his consistent performances that have had him average double figures in points all through his career. Despite it feeling like it is long overdue, the Missouri-born shooting guard has begun to gain plaudits as he was most recently selected to play in the 2018 NBA All-Star Game. Bradley Emmanuel Beal was born on the 28th of June, 1993 in St. Louis, Missouri. He is one of five children (all boys) of Bobby and Besta Beal. From a very young age, Beal, who attended Chaminade College Preparatory School, garnered attention in his city for his athletic ability. His talent earned him a spot on the USA team that attended the 2010 FIBA Under-17 World Championship where he was named to the All-tournament team. He was also named the MVP after averaging 18 points per game to guide his country to the championship. Following the highs of that tournament, Beal returned for his senior high school year where he averaged 32.5 points, 5.7 rebounds, and 2.8 assists per game. That performance earned him the 2011 Gatorade National Player of the Year and the Mr. Show-Me Basketball award as the top high school basketballer in his state. He further garnered First-team Parade and McDonald’s All-American selections. Upon graduation, Bradley Beal enrolled at the University of Florida to play under coach Billy Donovan. In his freshman college year, he was named SEC Freshman of the Week on six occasions. He went on to average 14.8 points per game that year to further earn SEC All-Freshman Team and First-team All-SEC honors. 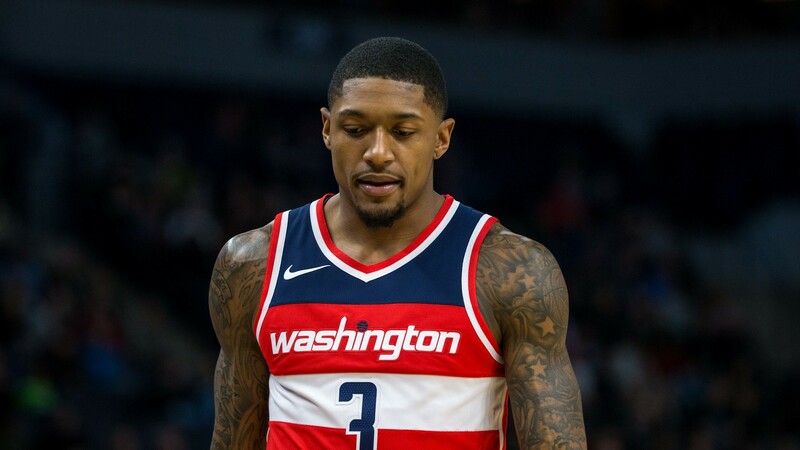 At the end of the season, Beal subsequently announced he was forgoing his three remaining college years to enter the 2012 NBA Draft where he was selected by the Washington Wizards with the third overall pick. In his rookie NBA season, Bradley Beal played in the Rising Stars competition at the 2013 All-Star Weekend. He maintained a high level of performance until his season was cut short by an injury although he still managed to garner NBA All-Rookie first team honors after averaging 13.9 points, 3.8 rebounds and 2.4 assists per game in 56 games. As of 2018, Beal’s best point average season was in the 2016-17 season where he averaged 23.1 points per game. His best rebounds and assists season came in the 2017-18 season where he averaged 4.4 rebounds and 4.5 assists per game. He has also so far made four trips to the NBA Playoffs, with his best showing coming in the 2017 season when the Wizards reached the second round and he averaged 24.8 points per game along the way. Bradley Beal is not yet married, but we can see why some reports might claim that he is. The Washington Wizards player has been in a high profile relationship with Kamiah Adams, a former reality television actress who famously appeared on Love & Hip Hop: Hollywood. The two have only been together for a few years but it seems like a lifetime as the couple loves to share pictures of each other on social media. On the 23rd of July, 2018, Beal and Adams welcomed their first child; a son who they named Bradley Emmanuel Beal II. Other than Tomas Satoransky who can play as either a guard and forward, Bradley Beal is the tallest guard on his team with a height of 6 feet 5 inches or 1.96 m. He further weighs 207 pounds or 94 kg. Beal comes from a very athletic family. His parents as well as all his four brothers; Brandon, Bruce, Byron, and Bryon, were college athletes. His father played college football for Kentucky State while his mother starred for Kentucky’s women’s basketball team. His two older brothers, Brandon and Bruce played college football for Northern Illinois and Alabama State respectively. Beal’s younger brothers; Byron and Bryon, played college football at Lindenwood University as defensive line and offensive lineman respectively. Since July 2016, Beal has been taking home an annual average salary of $25 million. This is thanks to the five-year $127 million contract he signed with Washington.